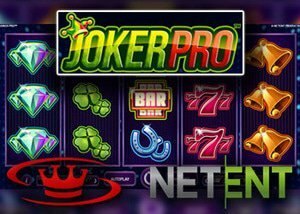 NetEnt has finally released the official launch date of its much-anticipated video slot Joker Pro and players can now look forward to winning like a pro from the 9th of February 2017. Containing 5 fast paced action reels, Joker Pro features a wide variety of combinations formable across its 10 payline offering an entwined classic, modern mixed atmosphere. Its charming retro symbols include clovers, bars, bells, horseshoes, sevens, and bars, while special bonus features boosting wins are up to 200 times multipliers, substituting wilds, hot spot wins, and a re-spins bonus feature. The new Joker Pro slot welcomes players with offerings including wins up to 100,000 coins, hot spot wins worth 100,000 and the joker pro re-spins. During the main game, one or more joker hat scatters on the 2nd, 3rd or 4th reels activates the joker pro re-spins feature, and during the re-spins round reels, one and five transforms into wild reels, and three hot spot positions appear on the center three reels including the 2nd, 3rd, and 4th reels. The joker hat scatters activating the re-spins feature transforms into a wild that sticks and the reels re-spin. Join Casino 777 today and enjoy the play on Joker Pro for free when it's released with the exclusive $21 no deposit bonus or up to $1,500 in free bonuses as part of the welcome package. The welcome package offers five free bonuses starting off with a 100% bonus on the initial deposit worth up to $100, on the second deposit a free 30% bonus increase your funds with up to an $350, on the third, fourth and fifth deposit a 30% bonus worth up to $350 each is offered. Maximize your deposits and claim $1,500 in bonuses! Software provider NetEnt has had an incredible start to 2017 and retained its crown as leading provider of digital online gaming solutions by winning the Casino Content Supplier of the Year award at the Nordic EGR Awards. The Casino 777 gaming collection also feature games from several other world-renowned software developers, such as Amaya Gaming, Playtech, Williams Interactive and Evolution Gaming. In addition to Joker Pro, the casino has other new games recently added that include Golden, Vikings Go Berzerk, Arcade Bomb, Life of Riches, Huangdi: The Yellow Emperor and Warlords: Crystals of Power. Progressive jackpots available at Betsafe Casino include Mega Moolah, Mega Fortune, Hall of Gods and Empire Fortune.